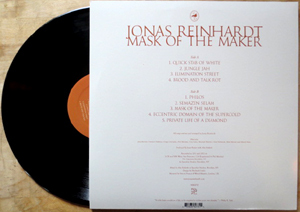 Vintage synthesizer music has grown from a fringe interest into something approaching an outright renaissance across the past half-decade, but few wield as much radical mastery in the realm as Jonas Reinhardt. 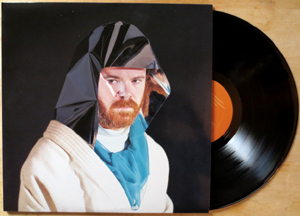 After a few years experimenting with group arrangements, Jesse Reiner (JR’s mastermind/alter ego) returned the project to a solo endeavor, birthing the distant moon terrarium Music For The Tactile Dome, the Klaus Schulze-spawn, The Prime Revealer, plus last year’s italo-kraut EP, Foam Fangs. All of which, in retrospect, feel like precursors to the pumping, cosmos-slaloming electro-opus, Mask Of The Maker. Crafted bicoastally (in San Fran & Brooklyn) over the course of two years, and incorporating an eclectic web of multi-instrumentalist collaborators – Damon Palermo, Diego Gonzalez, Phil Manley (who also engineered some of the sessions), Tim Soete, Steve Moore, Clint Newsom, Michael Barron, and Meryl Press – the record’s nine compositions represent the highest heights of The Jonas Reinhardt Xperience, fusing deep kosmische moods with jet propulsion lab experiments, classic galactic italo, soaring starblood synth workouts, funky astral ragas, psychedelic dust clouds, and mantric vocals. Mixed at Spacebar Studios by ex-DFA engineer Abe Seiferth and mastered by Simon Francis at Wired Masters, London, MOTM gleams and glows like nothing in the Jonas solar system so far. Wear the Mask. Maker cover portraiture and design by Shadrach Lindo. Black vinyl LPs in gloss-finish jackets.